A woman from London is missing off the coast of Mexico after a skydiving plane crashed into the sea. 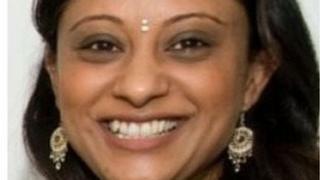 Varsha Maisuria, 42, a civil servant from Hendon, has been missing since the crash at Las Glorias Beach on Thursday. Ms Maisuria was involved in the crash along with four other people while on holiday on the Bay of Banderas. She and another woman are still missing after the plane crashed into the sea but the pilot and two men survived. The plane is now 1,000m underwater. Robin Nicole Ballachey, from the US, is the other person still missing, the Maisuria family said. Local search and rescue teams who are investigating told the family the plane had been found in the sea. In a statement to the BBC, Ms Maisuria's family, based in Loughborough, Leicestershire, said: "We are absolutely distraught at what happened. It is beyond our worst nightmare. We miss her desperately and want her to come back home to the family under any circumstances." "We were in complete shock and disbelief [when we first found out she was missing]. You never expect these things happen to your family. "You could never even imagine such a tragedy in the circumstances that unfolded. The fact that Varsha is still missing is extremely painful." A Foreign and Commonwealth Office spokesman said: "We can confirm that a British national was reported missing in Mexico on 7 May. "We are providing consular assistance to the family and liaising with local authorities."